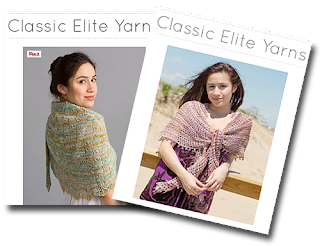 We hope all of you will join us in the Classic Elite KAL this summer. The main rules are: you must use at least 3 skeins of a Classic Elite yarn along with a pattern from their spring collection books. This month we are working on the Wavelength Shawl and the Cordelia Shawl. We must have a photo of your completed project by July 30th in order to submit it for the drawing! We will still assist those who continue to work on the May and June projects.